Sonni’s victory makes it five wins in five weeks, a streak that stretches right back to last month’s OluKai race on Maui, while Boothy’s triumph reinforces his meteoric rise and growing reputation as one of the men to beat on the international scene this year. Suddenly, the Aussie has gone from a dark horse to having a target on his back. Boothy claimed top honours in the “Battle of Bavaria” following an intense sprint to the line with his Starboard team mate Connor Baxter, after the pair had helped set the pace for much of the 18km race. Right on their tail all the way to the beach was Titouan Puyo (NSP/Quickblade), while Boothy’s compatriot Jake Jensen (Fanatic) showed a return to form in being the final member of the four-man breakaway group that took control of the race at the start of the third and final 6km lap. On the women’s side, Sonni’s trademark white SIC board had company from Seychelle Hattingh (Mistral) and Fiona Wylde (Starboard) for the first lap, however the world number three was too strong, pulling clear around the 8km mark to take a virtually unbeatable lead on the 2016 EuroTour leaderboard. Seychelle showed she’s not a one-trick pony, backing up her impressive win in Friday’s “Fastest Paddler” 200m time trial to finish runner-up in the 18km main event, edging out Fiona by just 10 seconds. Hobie’s April Zilg also showed strength, pushing hard the whole way and briefly closing the gap on Fiona and Seychelle before settling for a very respectable 4th place finish. Spaniards Laura Quetglas (SIC) and Susak Molinero (RRD) rounded out the top six, while unheralded Dutchwoman Petronella van Malsen (Fanatic) stayed in touch with the main chase pack all the way to the line for a well deserved 7th place. It was great to see a relatively large turnout on the women’s side, with 35 starters making the 2016 Lost Mills one of the biggest elite races on the international circuit. But if the women’s field was big, the men’s was huge — 126 starters in the elite division, which, combined with the dead flat conditions, made for an absolutely hectic start to the main event. With the elite men spread across the breadth of Lake Brombach, the opening 700-800 metres was a mad scramble to gain prime position before the draft train “lock-out” came into effect. 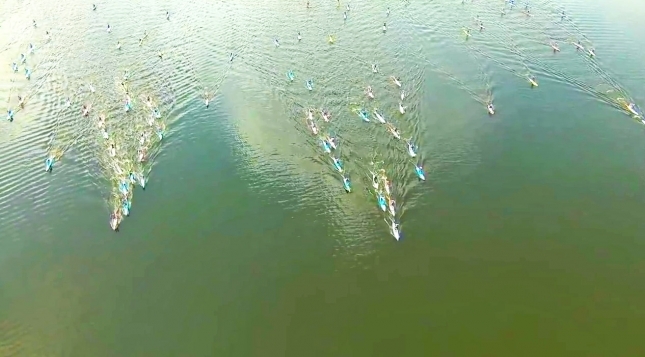 There were at least three flying V formations, with ultra dark horse German paddler Normen Weber leading the entire field up until the 1km mark (the video down below gives you a pretty good idea of just how epic the opening stanza was). As the first turning buoy approached (was this the world’s largest course race? ), the paddlers in the mid-packs slowly began falling into line and forming a seemingly endless train — at one point I counted close to 75 paddlers in the “lead pack”. But out front nobody seemed willing to take their seat, with the top 25 odd guys jockeying for position all the way the 3.5km mark, when a group of 22 finally broke free to setup the real contest. It was painful to see the guys in the second pack as they slowly but surely lost ground to the leaders. Like watching a lifeboat sailing away from a sinking ship, the guys in the chase group never gave up but were surely resigned to their fate of having to fight for the minor placings. One of the unlucky ones was California’s Noa Hopper (404), who was up near the front early but got caught on the wrong side of a weak link and permanently lost touch with the lead train; Noa and Paolo Marconi (RRD) worked tirelessly, but ultimately fruitlessly, to bridge the divide. With the field of 120+ being whittled down to just over 20 contenders, the favourites began to flex their muscles and push to the front, while those towards the rear of the lead pack gritted their teeth and held on for the ride as best they could. Mo Freitas (Focus) helped set the pace around the 4km mark, and he was quickly shadowed by the likes of Jake, Connor, Titou and Boothy, along with the Tahitian battalion of Georges Cronsteadt (SIC) and his ultra dark horse comrades Steeve Teihotaata (Mistral) and Rete Ebb (Starboard). Others to secure a spot in the lead pack for the bulk of the race included the Starboard army of Leo Nika, Beau O’Brian, Trevor Tunnington, the Hasulyo Brothers and Jeremy Teulade, along with Martin Letourneur (Hobie), Brazil’s Vinnicius Martins (JP Australia), Italy’s Davide Ionico and his Fanatic team mate from France, Arthur Arutkin, Italian dark horse Martino Rogai (Jimmy Lewis) and Japan’s national hero, Kenny Kaneko from Team SIC. Getting dropped early from this front group, and seemingly losing their shot at a top 20 finish, were the UK’s Ollie Shilston (Starboard) and France’s Joseph Gueguen (Nah Skwell). But rather than sit idle on the platform and wait the next train, Joseph and in particular Ollie put in a mighty fine performance to stay within shouting distance of the leaders for the remainder of the race. It was inspiring to watch them track the pace of the leaders from a short but insurmountable distance. The pair kept fighting and eventually overhauled a few of the top guys that hit the wall on the final lap, earning a well deserved spot in the top 20 when it was all said and done. But the most exciting action was certainly happening out front. Towards the end of the first lap, just as the pace was finally settling into a calm rhythm, Connor and Boothy took over the role of train drivers and instantly sensed an opportunity. With a near-90 degree left hand turn buoy approaching, the pair simultaneously attacked the field, seeking to open up a small gap and then hoping the rest of the group would get jammed around the buoy to give them some space. They continued with this fast-paced attack for the next minute, but like a pair of stage-win hopefuls testing the peleton during a stage of the Tour de France, the Starboard duo’s attempt to break free was quickly squashed, as first Jake and then the rest of the field regained touch and restored balance. At the end of the opening lap, the leaders again tried to make a break during the first of two beach runs (there was a 20 metre beach run at the end of the first and second laps), but it was again unsuccessful and the top 20 paddlers stuck together like glue for the next 40 minutes. Around the 12km mark, and with the pre-race favourites now firmly in control of the front pack as they once again zeroed in on the beach run, the boys attacked once more. This time they were successful. Hitting the beach to begin the third and final lap, Boothy, Connor, Titou and Jake used some fast footwork on the sand and a crazy quick sprint back onto the water to turn a three board length lead into five or six within seconds. Within a minute the gap had ballooned out to more than ten board lengths and the door was suddenly slammed shut: It would be a four-man race to the end. With the bulk of the lead group instantly being transformed into a chase pack, the likes of Georges, Steeve, Leo and Beau could only look on in resignation as the quartet of Boothy, Connor, Titou and Jake set a mean pace and paddled away with the race. As the clock ticked towards the 1 hour 45 minute mark, the four leaders began the final, adrenaline-filled “sprint” of roughly 800 metres from the last buoy turn to the finish. Despite already having completed 18kms of tiring paddling, the contenders seemed to find another gear and upped the pace to something that wouldn’t have been out of place in the previous day’s “Fastest Paddler On Earth” 200m time trial event. Boothy and Connor were in the best position with a few hundred metres to go, sitting side by side as Titou and Jake hung on their tails — it was almost like synchronised paddling as they sprinted towards the beach in parallel unison. Jake was the first to snap. With about 200 metres he could handle the pace no longer, which left Titou alone to fight the Starboard duo. But even though they were team mates and had worked together to control the race for almost all of the previous two hours, Connor and Boothy were suddenly transformed into fierce rivals, sprinting at a frantic pace, side-by-side, as they headed towards the inflated blue archway on the beach that marked the finish line. Titou, who had been sick all week and only decided to race on Saturday morning, never gave up and stuck with them all the way to the beach, however the New Caledonian was never able to pull alongside and had to settle for third behind these two guys for the second week in a row. Even with just a few metres of water left to paddle, the winner still wasn’t set, though Boothy had the best line and hit the beach about a half a board length ahead of Connor. The Australian sealed the result by sprinting the final 20 metres up the “beach” and across the line to the cheers of the assembled crowd, which included Boothy and Connor’s girlfriends – Kristi and Anae – who were standing side by side and looked far more nervous than any of the actual competitors. There was a minute gap between the lead quartet and the chase group, which had largely stayed intact over the final lap (with the exception of Mo and Arthur hitting the wall quite badly). But if the four-way sprint to the finish to decide the winner was intense, the fourteen-way battle for the final spot in the top five was downright crazy. With 500 metres to go, 14 paddlers all had a chance to claim 5th place. As you can see in the photo above, the pack split and turned into an every-man-for-himself dash to the line; When the dust had settled there was just 19 seconds separating 5th from 15th. Italy’s Leo Nika got the best of it, continuing his excellent run of form in Europe over the past 12 months to narrowly out-sprint the veteran Georges Cronteadt, who himself had prepared for this race by paddling at 2am back home in Tahiti to try and preemptively defeat the effects of jet-lag. Behind the powerful Tahitian were half a dozen athletes separated by less than 3 seconds, with Steeve, Beau, Daniel, Rete, Martin and Jeremy producing a photo finish for the minor placings on the top 10 podium — Martin from France was the unlucky one, missing a spot by just 18 hundredths of a second. But 11th place in today’s race was nothing to be ashamed of, and indeed anybody finishing top 20 deserves a huge round of applause; The 2016 Lost Mills was the single most competitive SUP race ever held outside of the USA, with several competitors mentioning post-race how this was the hardest contest they’ve ever been part of. And while many of the top spots went to the international stars, there were dozens of standout performances from the new wave of European athletes. You only have to look at how many “unknown” names were up near the top of the results sheet, and how many established names finished well down the order, to prove the point. 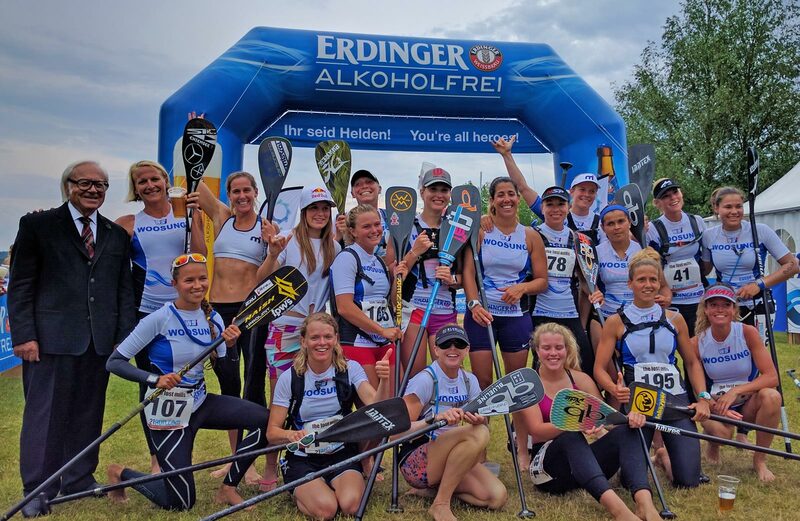 To put this race in context: Veteran paddler Belar Diaz finished 33rd at the almighty Carolina Cup last month; Here in Germany he finished 44th. So one thing that really stood out in this year’s Lost Mills was the depth of talent from the “emerging” athletes of the European paddling scene. 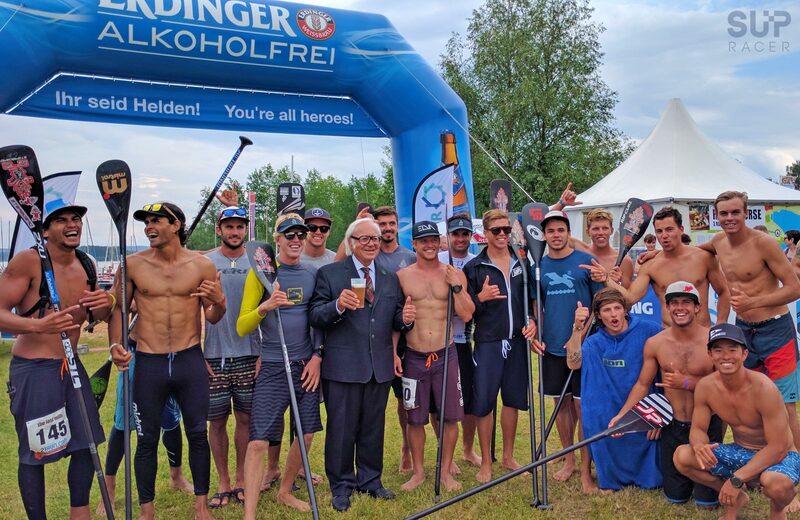 From the French connection to the “Italian Mafia” to the dark horse Germans from the world of canoe and kayak, it really is a great sign for the future of the sport in Europe. But while Saturday’s race was a celebration of European stand up paddling, it was Aussie Michael Booth’s day. Boothy came into this race on the back of a strong showing last weekend in St. Maxime, where he out-paddled Connor, Titouan, Steeve and a dozen other top ranked athletes to claim the SUP Race Cup distance event. However the Lost Mills was on a whole nother level, and some observers perhaps wondered whether he could consistently match it with the world’s best. Well nobody will be wondering anymore, with the former surfski champion now firmly entrenched in the upper echelons of the stand up paddle racing world; Boothy’s win sees him rocket all the way up to #9 on the updated SUP Racer World Rankings, quite an achievement considering he was ranked #38 just over a week ago. Is there any stopping this guy? Other big movers on the men’s Top 100 leaderboard include Steeve Teihotaata, who is now up to #24 in the world despite still holding only 4 out of a possible 5 best results. Steeve told me post-race that he and his fellow Tahitian dark horse, Rete Ebb (who is +8 this week), learned a lot during the race and know exactly where they need to improve on for the future. Considering the level they’re already at, the thought of these guys “improving” must be a scary prospect for the other top guys. Despite missing a spot in the top 20, Californian Noa Hopper is +9 this week to a new ranking of #34, while the Hasulyo Brothers made similar gains — Daniel is +8 to #21 while Bruno is +6 to #30. There was plenty of movement right across the board, so check out the full SUP Racer World Rankings to analyse the latest changes. On the women’s Top 50 leaderboard, Seychelle Hattingh has bolted into the top 10, where, based on current form, she will probably remain for quite some time. France’s Amandine Chazot and Spain’s Laura Quetglas are also big movers this week, while up near the top of the leaderboard, Sonni Honscheid is now breathing down the neck of Candice Appleby in the race for the world number two ranking. Anyway it was an amazing race this weekend, and hopefully our Starboard Live Stream presented by VMG Blades gave you a little bit of a window into the excitement (you can watch the full replay below). Thanks to the organisers, volunteers, brands, fans, media, the EuroTour crew and of course the paddlers who made the 5th Annual Lost Mills possible. With 203 starters on the line on Saturday afternoon, this was easily the biggest Lost Mills race yet. The 2016 EuroTour continues on next week to the Iberdrola Bilbao Paddle Challenge in the Basque Country of Spain, where we’ll be swapping the pretzels for some pintxos, and where most of the top names from the Lost Mills will once again do battle. We’ll have our live stream running once again, so I’ll see you there. In the meantime, check out some great photos from the official EuroTour media crew as well as PhotoFR.